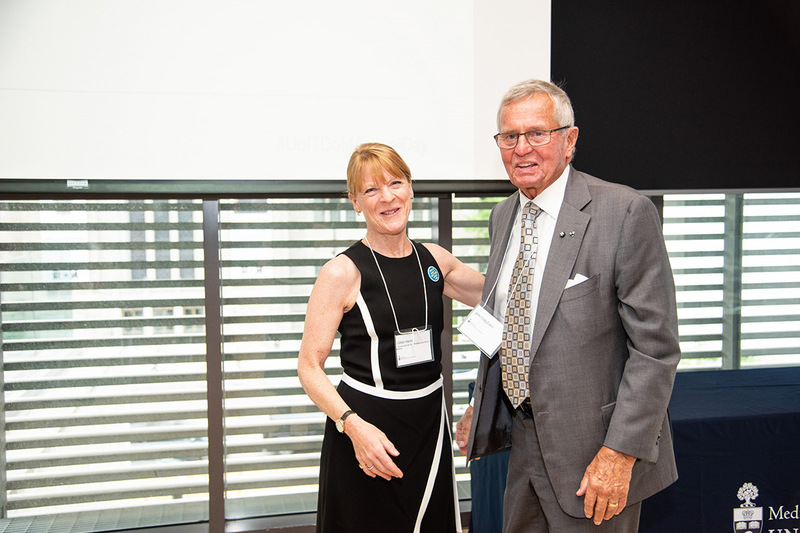 The University of Toronto’s department of medicine recently received a $1 million gift from John Craig Eaton II in support of the Eliot Phillipson Clinician-Scientist Training Program – equipping new generations of physicians to advance our understanding of disease through research. The commitment comes as the Faculty of Medicine, which oversees the department of medicine and several other departments, celebrates the 100th anniversary of the original gift – from Eaton’s grandparents – that supported the Sir John and Lady Eaton Professor and Chair of Medicine, and marked U of T’s first endowed chair and the British Empire’s first chair in medicine. “Over the past century, the Eaton chair has played a significant role in placing the faculty and department at the forefront of life-changing health research and innovation,” says Professor Gillian Hawker, who currently holds the chair. Prior to the chair’s creation, busy clinicians would carve out time from their paid clinical work to serve as educators or pursue research – areas that offered little or no compensation. “There was no system or structure to support physicians who wanted to teach and do research,” Hawker says. Dr. William Goldie, a member of the U of T’s department of medicine and a highly respected clinician at Toronto General Hospital, was a big proponent of the report. He persuaded U of T and the hospital to hire a full-time professor of medicine – a physician who would see patients, conduct research and teach students. He also reached out to the Eatons, who donated $500,000 to endow the professorship permanently. The amount is equivalent to $6.7 million today. The Eaton investment helped transform U of T’s department of medicine into a training ground for clinician-scientists – a shift that profoundly influenced medical education and discovery throughout Canada. It paved the way for academic physicians, post-graduate medical training, full-time clinician-scientists, affiliated teaching hospitals and clinical research units, including the clinical investigation unit where insulin was first injected into a patient. Today, U of T’s department of medicine is one of the largest in North America, training one-third of Canada’s – and one-half of Ontario’s – internal medicine specialists. With 800 full-time faculty members, 1,000 post-graduate trainees, and 20 specialty and sub-specialty divisions, it is the research and educational hub connecting six fully affiliated hospitals, four community-affiliated hospitals and more than a dozen additional clinical practice sites. The department is also a research powerhouse, generating more than $160 million in research funding annually.